The Kettler CATERPILLAR Tractor is a kids riding toy but it looks like the real thing! 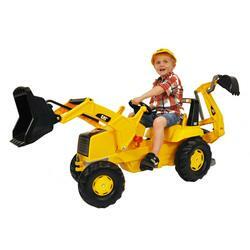 With a first of its kind back hoe digger included, a fully functional front loader, and a hood that lifts, this kids riding toy tractor will stretch your childs imagination to its limits! Made in Germany and constructed of high impact resin, this kids riding toy is sure to last. Size: 65 x 21 x 30"